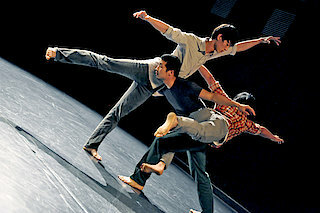 An experiment between East and West, a study of differing movement sensations. Whipped on by drums, two then four, and finally six dancers drive themselves on and on. A master of ceremonies bellows orders. People follow these orders – or not. We get the impression that these people are intimately rooted in their far-eastern cultural circles. To the unbroken rhythm of the drums they develop a clarity and power that go beyond national borders as their unabashed physical control – somewhere between breakdance, artistry and urban coolness – simultaneously illuminates and criticises their traditions.